What if you could have your favorite essential oils with you at all times. The ones you use to fight fatigue or enhance your mood or just keep the air around you fresh. I am not an expert but I have enjoyed the benefits of using essential oils. I wrote about them in my book, A Beginner's Guide to Assembling a Natural Medicine Cabinet and I diffuse them daily and now because of the sweet gift for review from Essential Charms I can take them with me on the go super easy and convenient. Aromatherapy provides the benefits of the oils as you inhale them. There is evidence that the oils are absorbed into the bloodstream when you inhale them so it can be safer and a more beneficial use over taking them internally. 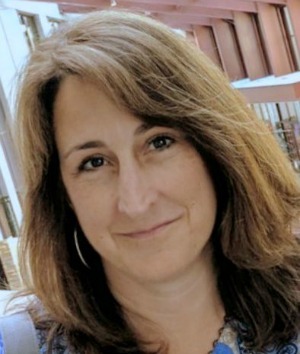 Again, I'm not an expert so I'm not going to go into all the medical details but if you're looking for more information I highly recommend DrEricZ.com and his book, The Healing Power of Essential Oils as a great starting place. Essential Charms gave me a beautiful diffuser necklace of my choice with a lava stone to try out and share my thoughts with you. I've never tried essential oil jewelry so I was a bit skeptical but after wearing this lovely necklace for several months, I'm ready to purchase some more pieces. The bracelets and earrings are next on my wishlist. I wasn't familiar with lava stones but loved the fact that the scent was so long-lasting. One drop stayed fragrant for two days on my stone. 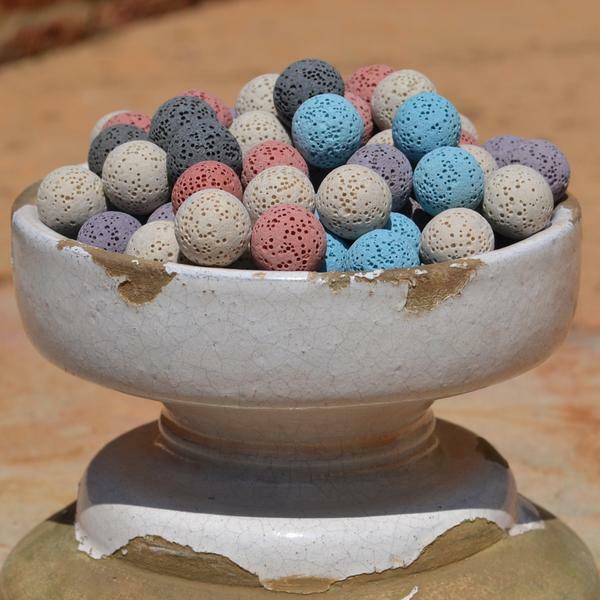 They have many colors of lava stones to choose from to put inside your necklace. After spending some time with this lovely jewelry I want to share with you my top benefits. No. 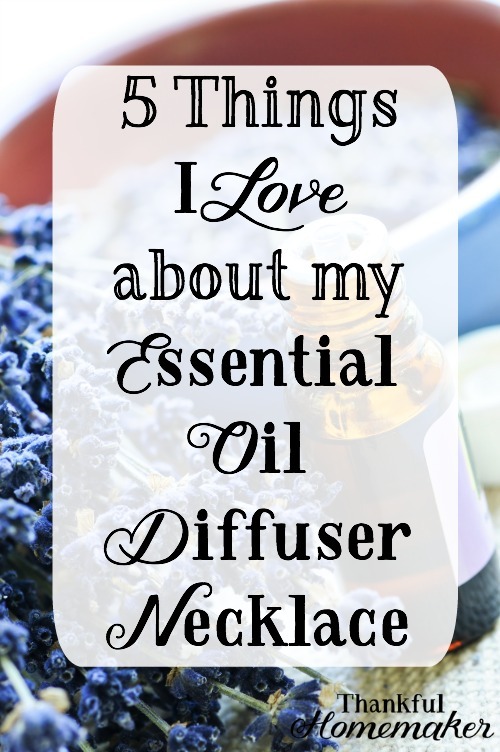 1 – A simple way to keep my favorite essential oils with me. I have favorite scents with lavender and peppermint being my top two and I could take them with me anywhere. I had a day when I was feeling a bit nauseous and took along my peppermint oil without having to carry an oil bottle. When I just want to feel like I'm in the middle of a lavender field, I had an easy way to get a scent whenever I wanted to. No. 2 – I love function meets fashion. I am a basic gal when it comes to fashion. The thought of my jewelry serving a purpose of more than just looking good is a win-win! When I apply oils with a carrier to my skin or mix them with distilled water in a spray bottle to use as a “perfume” the scent goes away quickly. Not with a lava stone. My oils have lasted a long time and the lava stone helps me to stretch them as I'm only using one drop a day. I'm not a purist by any means but I do find myself sneezing and getting watery eyes when I use perfume but not with essential oils. It's a clean, fresh smell and much more economical and healthy way to scent your life.I get many compliments from people asking what perfume I'm wearing. My favorite mixture is this recipe from Pinterest. 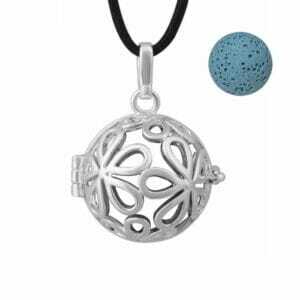 If you've wanted to give essential oil diffuser jewelry a try check out Essential Charms. They have a beautiful selection of necklaces, bracelets, and earrings at wonderful prices. Please let them know Marci from Thankful Homemaker sent you their way. You can follow them on Facebook and Instagram too. 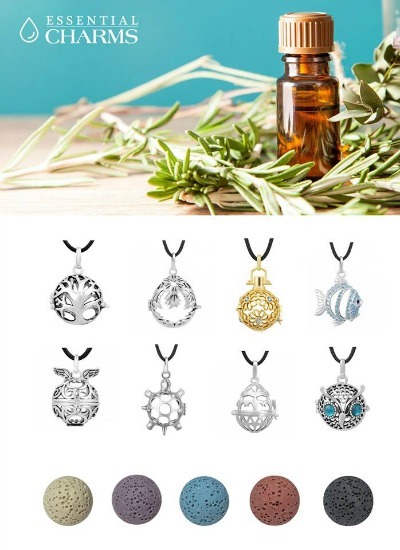 Do you have essential oil jewelry? What are your favorite scents and uses for it? Ultrasonic Essential Oil Diffuser – I love this one from my friend Joanna use the code MOM247 to get 5% off your purchase. Disclosure: This article is not intended as a substitute for the medical advice of physicians. No action should be taken solely on the contents of this article. The reader should regularly consult a physician in matters relating to his/her health and particularly with respect to any symptoms that may require diagnosis or medical attention.